New Jensen Website launched in November! Over the years we have been complimented on the information and ease of using our website. We spend a lot of time with the experts at the Worx Group in Prospect CT. We rely on their expertise to maintain a site that will benefit our customers looking for an affordable place they can call home in a Jensen community. Jensen’s Website should provide the information customers want to have and not just what we want to say. Ease of use is a top priority including simple navigation around and into the site. Customers should decide where they want to start and how far they want to drill down. A website should conveniently provide several ways to find information as well as the ability to easily contact Jensen people. Opportunities to share information with family and friends. Photos need to bring communities and homes to life. Quick and easy community or sales information. Help if you are unsure where to begin. On-going Open House dates and times. Directions to Open Houses, Homes for Sale and Community Offices. The highlights that make each Jensen Community a great place to live. Numbers to call and Information Request Forms whenever you want more information. More photos of Homes for Sale, Jensen lifestyle in well-manicured communities and surrounding areas. Phone numbers for communities and home information, as well as our Corporate Office. Thank you for following our Blog and we look forward to hearing from you on our new Jensen Website. Summer has officially arrived!!! All of us in the community look forward to the start of summer because the pool is open, fun outdoor events such as the ice cream social and Fourth of July parties are coming up, and so many beautiful colors are out in full bloom. We mark the start of summer with our annual pool party and picnic. Everybody gathers in the community building or out by the pool and we relax and enjoy the camaraderie along with some traditional summer fare. Not only do we get to enjoy chatting with old neighbors, but we also get to meet the new people that moved in over the winter. We bring our favorite summer dishes to share and try new creations as well. I was reading my favorite magazine called “Taste of Home” and they had a whole section of Patriotic Desserts that are perfect for July 4th. 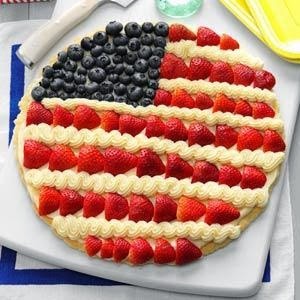 Here is a link that will take you to all sorts of great ideas for your celebration, just click on Taste of Home: Flag Recipes. My contribution will be to make the “Patriotic Pizza”. I almost forgot my other favorite part of the July 4th celebrations is watching the great fireworks display in town. It really makes me feel like a kid again! Have a Happy & Safe July 4th! Happy Fourth of July and Welcome to Summer! The summer really seems to fly by once the Fourth of July has come and gone. May’s Memorial Day Weekend can be considered the unofficial start of summer even though the Summer Solstice on June 21st is the official start of the season. The pace of summer with its outside activities, vacations, picnics, parties, family gatherings for graduations and weddings happily crowd our schedules. Time, one of the most valuable commodities of all, is at a premium in the summer. Finding or making more time give us an advantage to enjoy the expanded list of past times available to us. If we have less to do in and around the house, it can be to our advantage. Give consideration to where your time is going especially for those routine and required chores that must get done. If you are enjoying the free time you have you’re doing it right! If you are feeling increasingly burdened by your current home and yard, it may be time to start thinking about moving to a more accommodating and more leisurely lifestyle. A smaller, more modestly sized and one-floor home will give you more opportunity to pursue your dreams. Why stay weighed down with the drudgery of excessive house maintenance when there are more satisfying ways to live? We hope you can get more out of life and really enjoy the good times this summer with family and friends. Happy Summer to you all! Most people know that Jensen’s owns and manages manufactured housing communities for people 55 and over. This market niche evolved from the desire of customers to live in communities without young children and around more people their own age. Smaller one floor homes, and yards that provide privacy and independence are perfect for those ready to shed the too big house and laborious yard while still enjoying the American Dream. 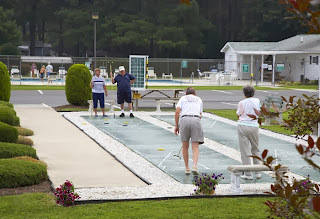 It may be a best kept secret that Jensen’s also has several communities for people of all ages. 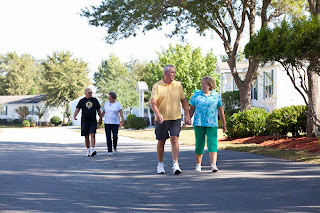 These communities still have the same quiet and low maintenance lifestyle that our 55 and over locations enjoy but allow people of any age group to take advantage of the benefits. Small homes and yards are also great for small families of all kinds with neighbors of all ages to get to know and help each other. Those of any age can check out our five New Hampshire communities in Nashua (River Pines), Concord (Crestwood), Tilton (Hemlocks), Lebanon (Hannah Village) and Dover (Farmwood Village) as well as our all age communities in Cambridge MD (Southside Landing) and Aiken SC (Crossroads). In this day and age, it pays to have a house that complements your family size and lifestyle. A home in a Jensen all age community may be just right for you and your family. I don’t know about the rest of you, but I know that I am ready for Spring! This has been a crazy cold winter. But even thru all the dismal weather we have had some great events at the community building. There was a Super Bowl Party, lots of pot lucks, a soup luncheon and a Valentine’s Day party. It was nice to see so many friends and neighbors at all of these events and other activities that took place in February. Hopefully March brings out some flowers that have been “resting” through the winter. Soon enough the birds will begin to fly back and the leaves will start appearing on the trees. There is also St. Patrick’s Day celebration with corn beef and cabbage as well as the monthly pot luck dinner to look forward too. The change of seasons also means that we will lose an hour of sleep but the better weather is worth it! I almost forgot to mention that we are on Facebook, so make sure you “Like” us on Facebook to see pix from all these great events and other fun pictures. You can also see photos from these events on our website which is www.jensencommunities.com. The anticipation of life in retirement on a fixed income is a humbling experience. But seeking out more simplicity in retirement is more than just living comfortably on what you have saved. Thoreau went into the Walden Woods to try and live as simply and as richly as he could. It seems that those contemplating retirement could also benefit from getting into this state of mind. We each get to define a retirement lifestyle for ourselves. If we can shed unwanted costs and some of the things we have gathered over the years our lives can become more meaningful in other ways. As our lives progress, we create a family, gather friends and build relationships. These are surely the richness of life. Unfortunately, we also accumulate a lot of stuff like a home or two, vehicles, boats, RV’s, furniture, clothing, and keepsakes. While these things help us to enjoy our family, friends, and relationships, they can also be a burden when we want to make a move into a new home or lifestyle. It seems that more people in their middle years (if they haven’t already) start to seek out more purpose and/or find opportunities to give back. A simpler life, home and finances provide the freedom of time and money to be more purposeful when you have more time to make the most out of life. At Jensen communities, we can help with a Simply Affordable Home in an outstanding neighborhood. Simply affordable living means having your monthly costs well within your means. What you pay for your home and community needs to fit your lifestyle and pocket book. Enjoying the benefits of private community amenities does not have to cost a lot. A comfortable clubhouse, swimming pool and pleasant common areas to walk and enjoy make life richer. They are also great places to meet and enjoy new friends as well as family. The Labor Day to Memorial Day period tends to be the most active in a Jensen community. 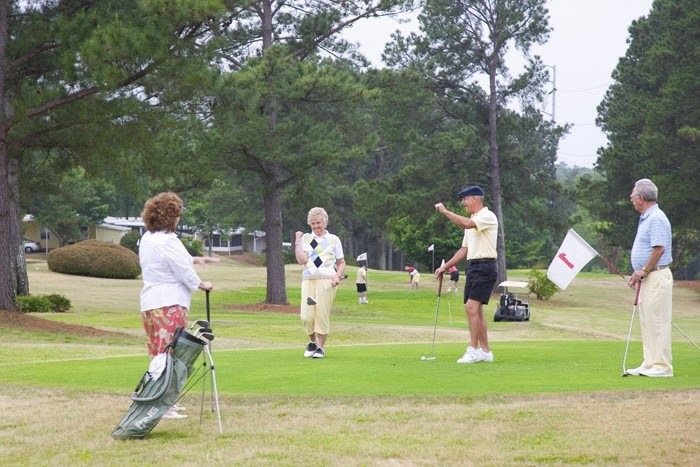 While summers are quieter with residents taking vacation or spending time with family, winters is the time for events, activities and trips out to eat or visit a special location. More Community News can be found at: http://www.jensencommunities.com/phpworx/index.php?cmd=community-news and choosing a State and Community.